Forgive me for acting the role of a withered old man and opening this conversation by talking about the weather, but the days are getting noticeably cooler and downcast and I am embracing the respite from the sun. When the sky is cloudless with a light grey hue it tends to dismiss humans and their petty vocations because its less violent and talkative creatures need vital H20. It gives me the feeling of ennui that I embrace like a long forgotten friend who ignites and inspires my creative energies with truthful exuberance. I imagine it’s the same feeling of animated sprightliness and mischievousness that caused Phillies fans to boo Santa Claus. They claimed he was drunk, skinny and beardless and who can blame them? There is a sushi restaurant less than a block away from my house that I like to patronize on occasion. Today I stopped in for a few .99 cent sake bombs and there was an interesting article in the newspaper (now printed with soy ink!) concerning stat guru Bill James. According to James and his own Pythagorean formula the A’s should be 7 games over .500. I’m not sure whether it was Billy Martin or Earl Weaver or every other manager in the history of baseball that said your team can only go as far as their bullpen; but whoever it was they were certainly correct as far as the 2015 Oakland A’s are concerned. 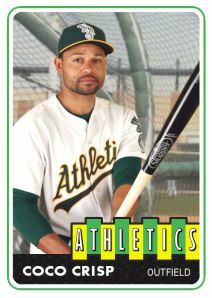 Coco Crisp returned from the D.L. on Monday accounting for 2 hits, all but doubling his season total and raising his average to .082. Although the aforementioned feat happened at the hands of a 9-2 drubbing by the Orioles, this seemed to be a special moment because of Senior Crisp’s injuries and dwindling ability to help this team. I would compare the moment he stepped into the box to a Rolling Stones concert–very expensive, way past its prime, and incipient of a moment that should be enjoyed presently because it will be over before you know it. Perhaps Mr. Jagger, he of the peacock candor, can tip his cap to that. 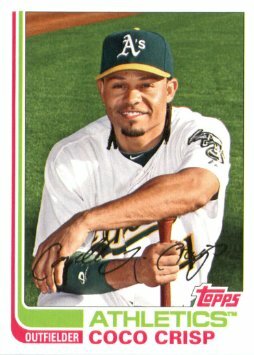 Coco Crisp was the singular player that made my mother fall in love with baseball. What makes it an interesting, even head-scratching affair was that she was in her 50’s when this happened. (A testament to his likability and edge of your seat playing style.) Perhaps it was his strange batting stance– bat held high and chin resting firmly on shoulder in an almost exaggerated motion. 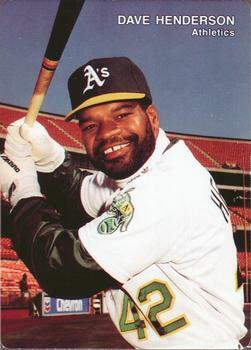 Or maybe it was simply because he always had a smile on his face and looked like he was actually having fun out there. (Hello, Mark Ellis!) She loved the tension in the ballpark when he was on the bag and eagerly awaited the eventual stolen base attempt. (surprisingly, he has only led the league once, with 49 swipes in 2011.) “He’s like a little flea!” she would exclaim. Last night my girlfriend and I were doing some shopping when I decided to buy my first pack of 2014 Topps. After opening the pack I was impressed by the photo quality and design of the product, even scoring a Tom Milone. I instantly threw it in an envelope and sent it out with the rest of my spring training autograph requests. (hint:players are MUCH more willing to sign during spring training.) The card to my left came to my attention after reading the blog “Jim’s baseball cards.” They thought I should pay homage…so here is my chance, and also a chance to give a shout out to a fellow blogger whose work I enjoy. Isn’t it strange that there is a blog named after a baseball player that doesn’t have a SINGLE post about said player? 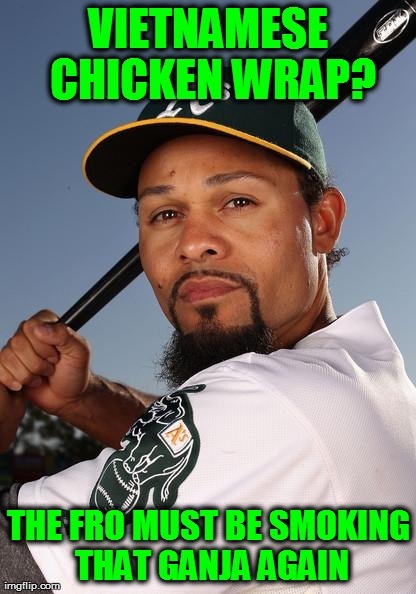 That’s what I thought, so I thought I’d share with you the lyrical stylings of Covelli “Coco” Crisp.